The Landsat Data Continuity Missions’s (LDCM’s) fully assembled Operational Land Imager (OLI) instrument was tested under thermal vacuum conditions by the instrument vendor, Ball Aerospace & Technologies Corp. During testing the band-average relative spectral radiance responses of the OLI were measured. 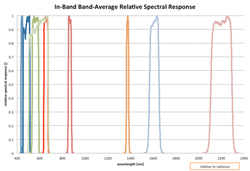 The relative spectral response curves are shown in Image 1. To perform the spectral response measurements, a tungsten halogen lamp was used to illuminate a double monochromator. (A monochromator is an optical device that allows a small range of wavelengths to be separated from an input light source.) The light output from the monochromator was then directed through a beamsplitter which sent part of the light to a monitor detector and part through a collimator (a device which creates a parallel beam or “column” of light) and subsequently through a window and into the thermal vacuum chamber where OLI was (Image 2). The OLI was pointed using ground support equipment so that the collimated beam covered 16 different locations for each band, one position at the center of each Focal Plane Module (FPM) and one each at the ends of the two extreme cross-field FPM’s. The size of the beam was such that there was sufficient signal to characterize about 60 detectors at each location. At each location OLI data were collected, with the monochromator stepping through the OLI spectral bandpass (See Table 1). 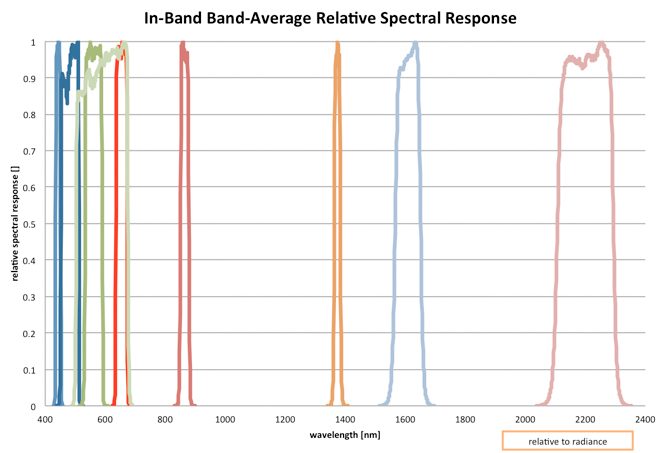 The characterization was performed across a fixed wavelength range for each band that was designed to achieve responses down to at least the 0.005 relative spectral response point.